Mix ingredients for peanut butter perfection and pour into mini-muffin pans (if you desire the shape above) or pour into just a small pan and cut out squares. Or…better yet, pour into the neat silicone molds that create heart shapes. You may need to melt the coconut oil (best to do it on the stove and then add in the peanut butter and raw honey.) If you do it this way, you can easily pour the peanut butter mixture into any pan or mold. Place pan/mold in freezer while you prepare the chocolate goodness. Melt the coconut oil and butter over LOW heat. Remove from heat and add cocoa and raw honey. Stir until well incorporated and smooth. Remove pan with peanut butter perfection and pour chocolate goodness over top. Place back in freezer for about 15 minutes and then they are ready to eat! I recommend storing in the fridge or freezer. I keep mine in the freezer because it is like ice cream. Yum. I challenge you to replace your pre-packaged, processed, refined-sweetened chocolate peanut butter treats with this WHOLE, healthful, beneficial treat. You won’t be disappointed! 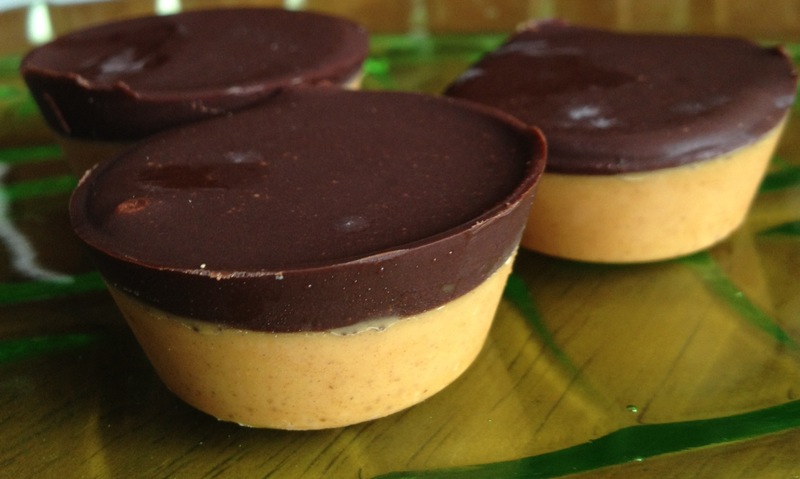 Thanks to http://www.mnn.com/food/recipes/stories/healthier-homemade-peanut-butter-cups#comment-244545 for inspiration to give it a new spin!!! These look great, I am going to try it for sure! Thanks for sharing! Let me know how you like them! I need to make more, I am having some major cravings right now! Great way to get just a little something sweet — yet healthy! I made these last night and they are so delicious! The perfect little after-dinner no-guilt sweet treat! Thanks again! Great recipe, they are delicious and look pretty too! Thanks! I am so glad you enjoyed them! The “prettiness” is the bonus! When I make it in a mini muffin tin, it makes 12. One is definitely enough because they are rich. These are DANGEROUS! I’m still laughing at your comment about 1 being enough…I don’t think they are still considered healthy after eating 5 in one day 😉 Thanks so much for this awesome recipe 🙂 I will try to practice “moderation” from here on out. So glad you like them! Sorry that they are “so dangerous!” Rest in the fact that they are prterty much like health food!! Could you substitute the honey for Agave nectar? (I’m allergic to honey and beet juice.). Yes, you could or even better – try maple syrup. Agave is highly processed and high in fructose. Let me know how maple syrup turns out if you use it. Good luck! My son is allergic to dairy. Would this work with Earth Balance? Oh, I do hope so! You can omit the butter and try all coconut oil. Or try the Earth Balance and let me know if you have success! These are delicious and my 2 year old son loved his too! Do you happen to have the nutritional info for these? Thanks! Emily, I don’t have the nutrition info. I personally don’t count calories anymore. I used to – extremely so – until I moved from a processed, diet food lifestyle to a whole foods, unprocessed lifestyle. I don’t eat perfect – probably 90/10 – but I no longer track what I eat and I maintain a healthy weight without really trying. If you are trying to lose weight, then just enjoy in moderation. Sorry I couldn’t provide more specific information. Enjoy! Could we use Stevia instead of honey??? If so, how much would I use? Thanks, they look delish! I honestly don’t know. Stevia is very healthy but I personally don’t care for the taste so I don’t use it. Let me know if it works out. Just omit the honey and add in a small amount of stevia till you find the taste you like. would canola oil work instead of coconut? Unfortunately canola oil would not work. Coconut oil provides the consistency needed and also, I highly recommend not using canola oil. Does this melt easily in hot climates as soon as you take it out of the fridge/freezer? Yes, I would keep in fridge/freezer until ready to consume – that is your best bet. I tried this with more coconut oil in place of the butter as I have no idea where to get the good organic grass fed butter here. It was a little coconuty tasting because of my change. I also was lazy to melt the chocolate part so it was thicker and I dabbed it in the middle. I made this recipe with organic earth balance because my daughter has a dairy allergy, and it turned out perfect. I also used dark maple syrup since we were out of honey, it added a nice flavor, I will be making these again. Thanks for the recipe. These are SOOOO GOOD! I made them last night and couldn’t keep myself from eating more than I should have. The only thing is i used a mini muffin pan for the mold and i had a hard time getting them out… They were kinda stuck so they dont look as pretty by the time I got them to pop out =( is there a special trick you use? So glad you loved them! One idea would be to get a silicone muffin pan, then you can pop them out or let them out on the counter for a couple minutes to allow them to soften a bit before taking them out. I usually let them sit for a few minutes and turn the pan upside down and knock them all out and store them in a container in the freezer. Hope this helps! Thank you for your answer above about honey or beet sugars…BUT, unfortunately, I’m allergic to maple syrup, as well :(. I’m allergic to EVERYTHING, actually, and just trying to find some wholesome things I can actually eat. Sorry to hear that, Tammy. One other item to try would be coconut sugar / nectar. http://www.vitacost.com/coconut-secret-raw-coconut-nectar I have never used it, but it is a healthy option that may work for you. Tammy..I am going to try to substitute100% pure (but pasteurized) apple cider reduction that I made myself, it turns out thick and syrup like , no added sugar just the natural sugar in the apples. Um, you are my new best friend!!!! These are DIVINE!!!!!!!!! Thank you a million times over from my family and I! Wow! BFFs!!! Chocolate and Peanut Butter seems to have that affect on people! SOOO glad you like them! Deelish! I made them yesterday. The process from start to finish was much shorter than I expected. Definitely a keeper here. Gracias! Thank you!!!! You are amazing, these are SOO GOOD! I only have homemade peanut butter: soaked/dehydrated peanuts with salt, coconut oil, and honey…would you suggest adding anything to it or just using the straight peanut butter? That would probably be fine – sounds very close to the recipe. I would just put that on the bottom of the pan and place in freezer while you prepare the chocolate and then add that on top of the frozen peanut butter. Let me know how that works! What about replacing the cocoa for raw cacao? yes! I use raw cacao in this recipe. They can be subbed 1 for 1. Making these now. Can’t wait! Unsweetened coco? Pieces of a chocolate bar, nibs, powder? What works best? I use unsweetened cocoa or cacao powder. You could make it simpler by melting down an already sweetened chocolate bar but most likely that will have refined sugar. So if you are trying to avoid refined sugar, use the cocoa and honey. For the “health” aspect of this treat, I would also have liked to know an alternative to the prepared (roasted) peanut butter because apparently that is a no-no. Not sure if raw nuts taste as good. Apparently most nuts CAN be roasted at a very slow temperature of 200 degrees (obviously for a fairly long time if they are whole nuts, but smaller, broken bits can lightly toast safely apparently. Then one can blenderize their own peanut butter and really get a healthy benefit from this delicious pb/chocolate-lovers’ treat! You can try raw nut butter…but I have not experience with that. I eat raw nuts all the time, but eat roasted peanut butter because that is what I find at TJ’s at a good price. I have heard that roasting nuts (or legumes) does not remove all the nutritional value, thankfully. However, if you have the opportunity to by raw peanuts and make your own butter (add in a dash of salt,) I am sure that even increases the health benefits of this treat. Thanks for your comment! I used ice cube trays for molds. It makes 2 doz 2 bite size pieces. Thank you for my new favorite treat. These look awesome. Do I use the old-fashioned kind of PB or the kind that doesn’t separate? The old-fashioned kind but either would probably work! Enjoy! Can’t wait to make these! Do I use old-fashioned peanut butter or the kind that does not separate? I use the old-fashioned kind from Trader Joes. I just mix it real good prior to making the recipe. You could probably use either kind, though. Thanks for the recipe- I can’t want to try it! I’ve been meaning to start using coconut oil because I’ve heard it has health benefits… this is good motivation to try to find it. Can I use almond butter as a substitute? You can but I have received mixed reviews with almond butter. Sounds yummyI will make this . I have another recipe for choclate it is with coconut oil too. Yeah! I hope you like them! I am hoping to make these next week. Do you have any idea how long they will keep in the refrigerator? I am wanting to take some when I go out of town to visit family. I keep them in the freezer until ready to serve and I imagine, if sealed well, would last 1 to 2 months. Thanks! Your blog is beautiful! I am glad you liked them! I’ve been eating a mostly whole foods/paleo ish diet for some time now. While my BF is definitely a good sport about the meals we eat together, he still likes processed candies. I don’t want to tell him what he can and can’t eat, but I’m definitely bummed when that’s all he has to resort too. This turned out to be a great meeting in the middle–a little sweet for me, but he LOVED THEM! I made my own cashew butter, used all coconut oil (I’m allergic to casein), and they were perfect. Thanks for the recipe!!! These are great with almond butter! Even my picky Tweens eat them, and they don’t even like almond butter! Will try the peanut butter version next time. These are delicious! We are on our 2nd batch now.. These look delicious! Will try them next time I make candy. These are amazing! I make them weekly. Thanks so much for this tasty and easy recipe! Line your pan with parchment paper, then stick the whole thing in the freezer. once they’re set, just lift out by the parchment paper, cut into squares, and peel the parchment off. Made these w so sweetened almond butter that hubby accidentally bought. I omitted the honey from both parts to account for this! Yum! I used paper liners & that made for easy removal from tin. Awesome! That is good to know! Glad you liked them! These are amazing! I ran out of coconut oil while making them, so I had to use a little olive oil…they still came out great! Made these today. They were great!!!! I am glad you liked them! Thanks for commenting! Great recipe. Excited to try it. Thanks! Let me know how you liked it! I printed this recipe out probably a few years ago and have cArried it around in a stack of such recipes through at least two moves. Finally made them tonight. Can’t believe I didn’t do it sooner!!! SO awesome, and so very simple. I used my heart shaped silicone molds and the recipe perfectly filled two. Looking forward to keeping these on hand more, and even playing with the idea to see what other flavor combinations it might inspire for me. Thanks! Wonderful! I am so glad you love them! Let me know if you discover any neat new combinations.